Last summer, when my five sisters and I needed a break from our husbands, kids, babies, work-heck, we needed a break from our lives -- we took off for a long weekend in an RV, driving it to a family camping resort near the seashore. Our "Girls-Only Weekend," which featured lots of laid-back fun and laughter, was one of the most successful trips we've ever had. The RV provided a relaxing, easy way for us to be together. Situated just a few feet from a large lake, a sandy beach and beautiful woodlands, the soothing sound and smell of the water and the trees was a welcome retreat. 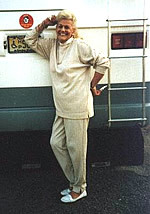 We're not the only women who laud the benefits of the RV lifestyle. The RVing Women website cites rising incomes, delayed marriage, divorce and longer life spans as some of the reasons behind a growing number of women with the means to see the world, but without husband or family to accompany them. In addition, they point to social change and sheer demographics which have shattered lingering taboos that once discouraged women from traveling far without a male protector. "Seeing what a glorious country we live in is a real draw," she said. "You tend to not think about problems and what's going on at home. RVing is an escape!" Many women also like the freedom and flexibility an RV gives them; the easy access to Nature traveling in a rig provides; and the safety and familiarity of taking their home with them wherever they go. "The benefit, I suppose, is the freedom to go where and when I want to, as slow or as fast as I want to," says Francey Smith, a member of SOLO-NET, a free private e-mail network for single RV and camping enthusiasts. "To visit overnight with whomever I befriend, and never feel that I am imposing, as I have my own bed for the night, my own meals. "Even in groups, I can retreat to the motorhome when I seek aloneness, for whatever reason, and no one thinks anything of it," she said. "RV travel allows me the freedom to go (and stay) when and where I want and take my own kitchen, bed, and bath with me," says Joan Taylor, who has driven her small Class C through much of the U.S. and western Canada. "My small RV can be driven and parked where a larger rig can't. I have a dog, and she travels along -no kennel for her." "I love traveling in an RV because I'm always at home," agrees Arline Chandler, a newlywed now on the road with her husband after a few years spent solo. "I have my own things. I can stop and be in one place for a few days, or I can be continuously on the road." Eva Ribman divorced four years ago, but refused to give up the lifestyle because she enjoyed it so much. "Initially, my ex and I shared expenses on the RV 50/50, but I recently bought a brand new, 32-foot 2002 Fleetwood Southwind," she says excitedly. "I'm confident that I can handle my rig, and I'm counting down the days until my next trip." Although many more women have taken to the road during the last few years, some were truly RVing pioneers. 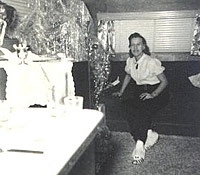 Vivian in her 1946 American Mobile Home in 1952. Seventy-seven year-old Vivian McGraw began her RVing journey more than 50 years ago as a young newlywed who followed her military husband from base to base. First they pulled a 1946 American Mobile Home trailer with a '47 Caddy convertible, living in trailer parks when they settled somewhere briefly. "Getting from base to base often meant staying overnight at gas-stations, small country stores, or alongside the road," remembers Viv. "When it was near dark, I'd look for a space big enough to get far enough off the road not to have the rig rock so badly we couldn't sleep as cars and trucks went by." RVs weren't so common then, and Viv remembers how much attention theirs got. "Ours was the only rig for maybe hundreds of miles," she explained. "People would see me pass through town and do a double take, and many would wave and smile or give us the OK sign. I loved every minute of it all." Then the young couple bought a 35-foot, second-hand Mobile Cruiser mobile home for $500. "It was most certainly not self contained," says Viv. They got the necessary hookups in the trailer parks, where rent cost them a booming $7 each month. "There were no Laundromats and I had no washer, much less a dryer," remembers Viv. "Eventually I had two children, so I washed diapers by hand in the bathtub every single day. He had his uniforms done on the base, but I did the rest all by hand. All mine and the kids' clothes had to be ironed, too-no wrinkle free materials like we have today." Often a kerosene lamp provided the only light they had, and Viv cooked on Sterno while on the road. They filled up gallon jugs with water when they left each trailer park, and Viv bought blocks of ice from ice houses and put them in buckets in the fridge with the baby's milk bottles. "I've loved the Vagabond life," she says. These days, Viv travels "in a palace compared to what I had then;" her 1998 37-foot National Dolphin allows her to travel in well-deserved comfort. Like Viv, many women adore the adventure and spontaneity of RV travel, and the way RVs bring nature and the outdoors closer. or sitting by the fire at day's end and talking with your friend or husband, watching the flames. You can't do those things from a hotel room!" "The enjoyment and freedom of driving one's house down the road is something I'll enjoy as long as I'm able," says Joan. "I enjoy the 'going' just as much as the 'getting there.'" Several groups cater to singles or women RVers on the road; some offer online discussion groups to make it easy for members to trade helpful hints and travel information; classes to help newcomers learn to drive the big rigs; and opportunities to meet others. 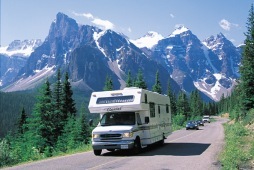 Loners on Wheels - An "international club of 3,000 single men and women who enjoy traveling, camping, RV caravaning and the camaraderie and lifestyle of singles," celebrated its 30th anniversary in 1999. With chapters all over the U.S., Canada and Mexico, members get a newsletter and access to online discussion groups. Monthly campouts generally include activities like dancing, trips to local attractions, dinners out, potlucks, cards & games, campfires and good conversation. Rallies are held in various parts of the country, too. RVing Women - This club began in June 1988 with an RV rally in California and a meeting notice that drew so many women RVers that a second meeting had to be scheduled the next day. Now boasting almost 5,000 members who range in age from 20 to 80, with the majority in the 50-65 age group, many members use computers to keep in touch with their buddies- more than 40 percent of the membership is represented in the group's e-mail directory. Many members are professionals and about a third are retired or semi-retired. SOLO-NET - A free private e-mail network for single RV and camping enthusiasts, is made up of widows, widowers, and divorced and single-by-choice adults. Members exchange ideas, information, gossip and travel tips; its owner, a widower and retired computer programmer, likens it to " sitting around the campfire at "Happy Hour."